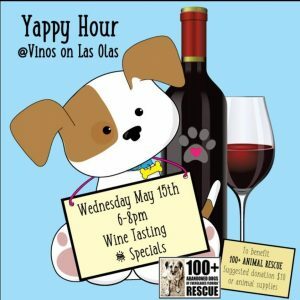 Yappy Hour Wine Tasting fundraiser at Vinos on Las Olas | 100+ Abandoned Dogs of Everglades Florida, Inc.
Come out for a Yappy Hour Wine Tasting fundraiser at Vinos on Las Olas, 922 East Las Olas, Ft Lauderdale, Wednesday, Maay 15th from 6-8pm with a suggested $10 donation benefitting 100+ Abandoned Dogs of Everglades Florida. Wine and Raffles!! Help us continue our mission to Rescue, Revive and Rehome. So many in need.